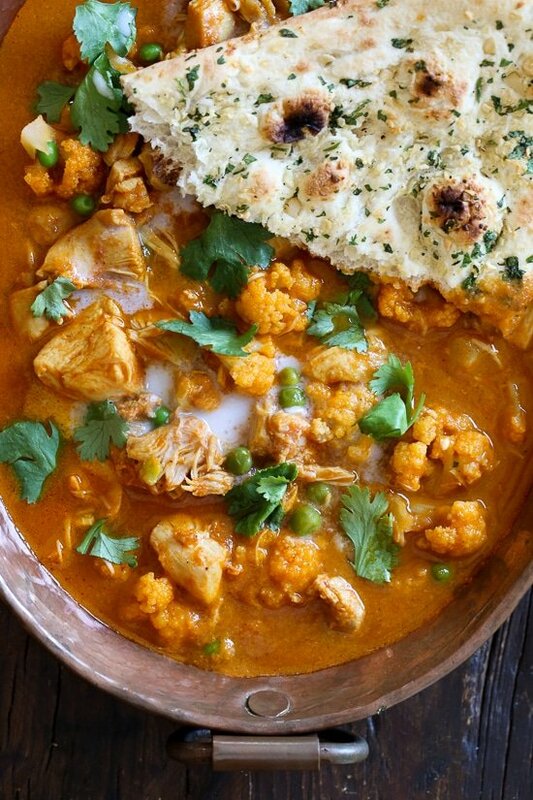 This is a great beginner dish if you’re new to Indian food, which is said to originate in the UK, very similar to butter chicken. 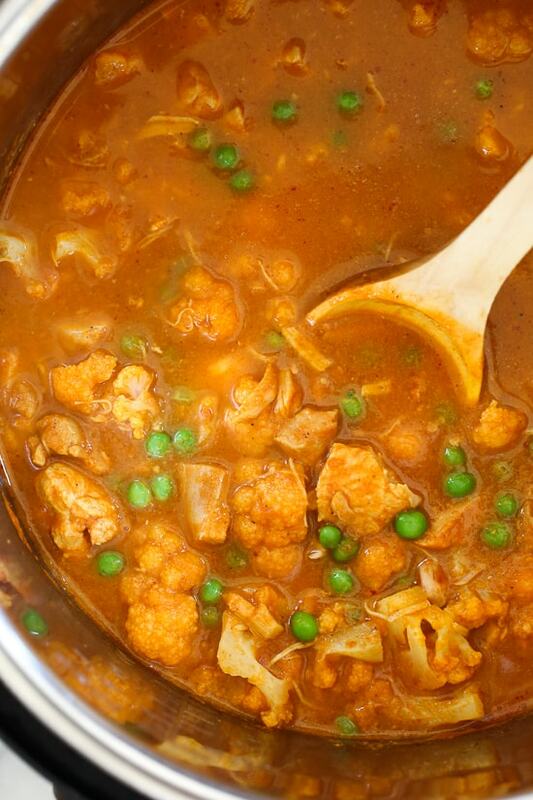 Vegetables are not typically added but I love the addition of cauliflower and peas. My husband and oldest daughter Karina love it with both rice and garlic naan which I buy frozen at Trader Joe’s. If you don’t have a pressure cooker, you can simply make this on the stove and double the cook time. You could easily make this whole30 or paleo by eliminating the peas and serving this with cauliflower rice. I have tons of Instant Pot recipes, click here to see them all! To see more chicken recipes, click here. 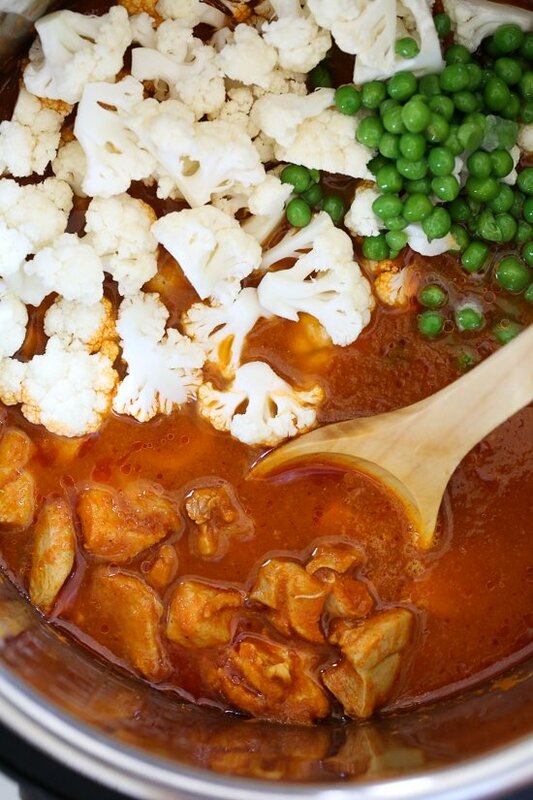 I’ve created a lightened up, dairy-free Chicken Tikka Masala with Cauliflower and Peas in the Instant Pot to satisfy my craving for Indian food! Season chicken with 1 teaspoon salt. Press saute button and melt the butter, add onion, garlic, ginger and 6 spices (from coriander to cardamom) and saute until the vegetables are soft and the spices are fragrant, about 2 to 3 minutes. Add the tomatoes and use an immersion to blend until smooth (or blend in the blender), add the chicken, remaining 1/2 teaspoon salt and stir, cook high pressure 15 minutes. Quick release, add the cauliflower and peas and cook 2 minutes on high pressure. Quick release, stir in coconut milk and serve garnished with cilantro. 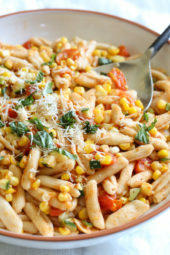 Can you please post how to make this recipe in crock pot using chicken breasts? Recipe sounds yummy, but I don’t have an instant pot. This was very good but the sauce turned out more watery/thin than I was hoping. Any suggestions to thicken it up? Made this last night and was blown away with how easy it was to make and how delicious it was. 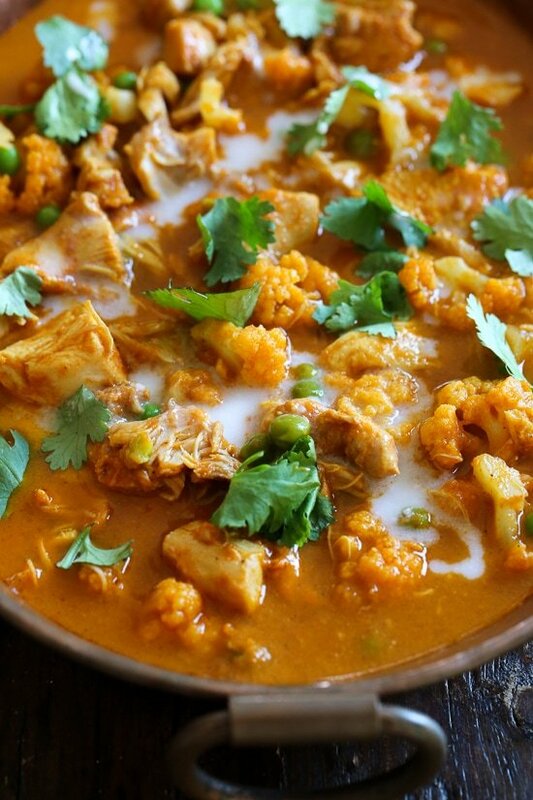 Even my “hates anything that resembles Indian food or curry” husband loved it.This will be in my regular rotation, so I think I will up the spices (personal preference) and serve it over steamed cauliflower instead of rice (for me, the rest of the fan can have rice). My family loved it!! I added extra peas and cauliflower and 1 can garbanzo beans. We will definitely enjoy this recipe again. 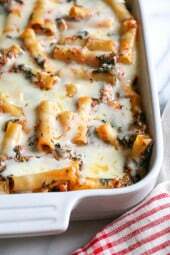 Absolutely one of my favorite recipes! I make it stove top, and it is always a hit. I don’t have an instant pot… any cooking directions different cooking stove top? Can I make using frozen chicken thighs? What should I change? Can I make it in the slow cooker? I don’t have an instant pot. The directions say to just double the time! This was good and definitely satisfied my craving for something spicy and rich. However, the chicken ended up completely shredded and I didn’t end up with a ton of sauce. Also, since I served with cauliflower rice, it ended up being dominated by the cauliflower. I also doubled the cayenne and still found it too mild. I’m going to try making this again, but cook the cauliflower/peas separately and either up the cayenne more or add a serrano chili. I just received an Instant Pot for my birthday, so I was able to make this recipe exactly as written. It was DELICIOUS. No tweaking necessary. The chicken was perfectly cooked and the dish had excellent flavors, absolutely lovely. 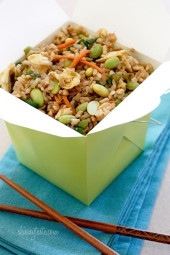 This is making it into my regular rotation of recipes.Thank you for the great recipe! This is why I always check your site first when looking for meal inspiration. This was so good! I could drink the sauce! My only problem was sticking to one serving!! !Question: Do you think this would freeze well?THANKS! This was seriously the most delicious meal I’ve ever made!!! So much flavor, I did not need to modify at all 🙂 This will definitely be a regular meal from now on!! I made this recipe and used chicken breast and a fresh broccoli/cauliflower mix. It tasted and smelled wonderful! My only issue was that it was a bit watery even after the coconut milk, other than that, it was great. I will make it again. This recipe is fabulous. My entire family (including a 10 year old, 8 year old and 5 year old) devours it. We do scale back on the cayenne a bit for the benefit of the 5 year old who thinks minttoothpaste is “spicy.” We double the recipe in a 6 quart instant pot and always add extra cauliflower and peas (if my kids are going to devour something, I am going to make the most of it and hide as many veggies as possible!). We serve over basmati rice with some naan and always have plenty of leftovers for lunches. This is one of my favorite Skinnytaste recipes. Thank you, Gina!! You’re welcome Claire! Glad everyone enjoys it! Hi there: do you need to alter the cooking time if you double the recipe? Thx! Absolutely delicious and easy to make! I am wondering why its 5 points in WW though as chicken thighs, coconut milk and the butter seem to be the only ingredients with points values….Still, its AWESOME! I am not usually organized enough to defrost the chicken, can this recipe be made using frozen chicken thighs? If yes, what should I do different ? As usual, another hit!! I will never order Indian out again. This is phenomenal. Thank you for sharing this amazing recipe. Do I increase the cooking time if I double the recipe? Can I use curry powder instead of the individual spices listed (coriander, cumin, turmeric, etc.)? I really dislike all things coconut. I have always wanted to try this (and other dishes like it) but am scared of the coconut milk. Can you actually taste coconut or does it just help with the flavors of the dish? Yes, you can taste it a bit. I don’t love coconut in anything except baked goods (go figure), so when I make it next time I’m going to use regular milk and see how it goes! Coconut milk is thicker than regular milk so I use evaporated nonfat milk like carnation brand instead and it’s fantastic as a substitute if you don’t like coconut. It will bring the points down also but not sure what new points would be. I don’t think you can taste it at all. I loved this recipe! I just bought a pressure cooker and this was the first dish I made with it. I don’t think I blended my tomatoes very well but the flavor was there. Super delicious, will definitely make again! Could this ne doubled for the instapot? 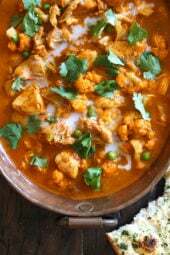 Absolutely delicious and easy version of Chicken Tikka Masala. Probably one of the best quick versions I’ve made PLUS the calories are low. We love Indian food but we’re also obviously trying to keep the calories and cook time low. This recipes hits all marks. Thanks again Gina for yet another fabulous recipe. Made this with breast meat and butternut squash that I roasted w garam masala and it was so delicious. Brought points down to 3 too! I finally tried this on stovetop. I used the dark meat only. Added more cumin, garam masala & cayenne pepper. I cooked it with potatoes that I parboiled. Delicious! Thank you for the recipe I have your book. And will be buying the latest one too. How long did you cook stuff for on the stove? I’m a uni student and lack cooking experience, it may be a silly question but I’m unsure! Thank you! Could this be made in a slow cooker? Thanks! Would this still taste as good without the cardamom? Don’t feel like buy a spice I don’t use that often. I’m not a fan of cardamom so we skip it and it tastes great! I happen to have cardamom essential oil so used a toothpick of it, worked great. Before I remember that I looked up substitutes and found equal parts cinnamon and nutmeg..
Yummy! Could you make with chicken breast meat? Am new to pressure cooking. Have been advised on other sites to always have a minimum 375mis of water in the cooking container but your recipe appears not to mention? I was worried about that because I hate when my instant pot burns, but it wasn’t a problem. Tomatoes and chicken have a ton of moisture that comes out when they steam. What do I do if I accidentally bought refrigerated carton coconut milk instead of the can?? Help please! Currently making it and just realized! We enjoyed this, though I added more veggies (extra peas and cauliflower, as well as some carrots) and would probably increase the amount of spices next time. I would also caution people about using an immersion blender with such a small amount of food — it splashes everywhere.